After seeing informative posts from Reb Zvi and Reb Avraham Chaim about dio,and the posts by Reb Moishe and myself prooving how many problems "metaygim" make is it not about time we boycott tagimmachers? or for the least they should have kabala and use ink with hechsher. 7)reb moshe showed how kutzo shel yud can get killed by metayeg. But, R' Shmiel,take a larger look at the matzav - NO ONE should be allowed to touch sta"m unless they have at least a kabolo. Period. Not Judaica stores, not metuyagim, not the sochrim who travel around to stores, not community rabbonim (who often given the worse advice because they know enough to be dangerous)--- NO ONE. I don't know about you, but 85% of the time I feel like a glorified janitor - I just clean up messes made by ignorant (and sometimes dishonest) Judaica stores and sloppy soferim. How come you get 85%? For me its more like 95%! Question: As a sofer working in an established Juadaica shop, how do you deal with the fact that some people may think you are criticising their stam only because they did not buy it from you? I'm still learning how to navigate that issue. BH - the two kollels here, the yeshivos, and the rabbanei batei kenesios know me from before the store opened and they tell the kehillos/baalei batim that I can be trusted. Their support makes things a lot easier. Also, I always try to praise good work and good soferim to the customers whenever I can. I have a metayeg in Israel that is an erliche guy and boki in halachos and just didn't make it as a sofer. I like to use him as much as possible. and be sure to forward it also to the "few people in the field" you spoke to. Elad, you ask a very good question. 95% of magihim today use rapidograph's for tikunnim on stam, myself included on occasion(Although I have been using Zvi's ink for some time now). 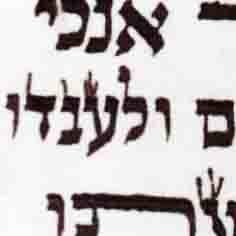 If standard rapidograph ink is not kosher, as Reb Zvi asserts on his blog, and making a bracha on stam with non kosher ink may be considered a bracha levatallah (As Rav Bloomenstiel asserts on this furum) then, yes, the fact that today's poskim have been silent on this issue is actually quite scandelous. Again, I would love to know what todays morei horoah have to say about this, particularly the Rabbis of the Vaad, who's job it is to protect the kashrus and integrity of stam. I am also wondering... is it possible to use STAM ink in the pens? I heard it would clog them up etc...would "medalel" help? I don't think using a kulmus to do tagin is shayach, as it would be really easy to mess up the parshiya/smaller Mezuzot. Not only does it clog them, but it also causes them to rust. I find you can use a kulmus to make taggim. If when you cut the kulmus you are careful to make the slit in the quill EXACTLY in the center then it will ink endlessly if you turn it on its edge and write with the right hand corner of the tip. I find this gives very good results and is my normal technique as it's very convenient and quick. For very small ksav, I find that I can get more exact results with a kulmus made from a goose rather than a turkey, because the goose quill is much thinner and lays down less ink. Another technique that works very well is to make a kulmus just for tagim that you cut to a point, with a slit in the center. It will take normal dyo and write with much finer lines than even a rapidograph can. I do not think that is practical. I have seen many pairs of Tefillin get ruined from such "hiddurim". When you have a small parshiya with small tagin on it, a kulmus is not an option...you can do more harm then good. 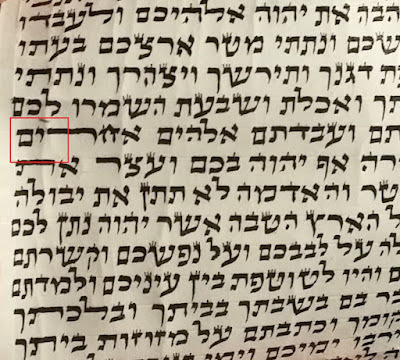 I know of a few Soferim who work 'exclusively with kulmusim' and I found that oftentimes their parshiyot have problems, either the ink did not dry, or they smudged it and then did possible chak tochot. For me the question of only using a kulmus to write has nothing to do with hiddurim, it's simply that from experience and experimentation I have come to view the quill as the best tool available for the job. I have little use for the impractical or the fanciful, if it doesn't do the job, either adjust the tool or get a better one. On the other hand, think it's important to regularly critique one's own level of skill, tools, work and method with a view of constantly improving them. For example, when a mistake happens, it's valuable to be able to identify exactly how it came about. For example, was there a lack of muscular control in the hand and arm, was the quill not sharp enough, or cut improperly, was the ink too glutinous, was the klaf too slick. Then develop strategies to counteract or correct the defect. Handwriting exercises for example to improve motor skills and eye-hand coordination, or checking the flow of the ink on a small slip of klaf after each dip in the kesses. I think that sometimes the education of a sofer is very thorough on the side of the halacha, but is somewhat thin on the side of developing solid method and learning to understand and exploit the full potential of his tools. As to making forbidden corrections this has less to do with the kulmus and more to do with a lack of yiras shamayim. Elad have you tried dio lanetzach thats made special for rapidograph with a hechsher? Perhaps Zvi can post where its available in israel.Its great. Rabbi stern brings 5 reasons not to use rapidograp see biur hasofer siman gimel d"h bedyo. I have used the dio to write a Megillah, but not for a pen...is it the same ink or specially made for rapidograph? Does anyone use dip pens, I find them to be very effective on micro details. 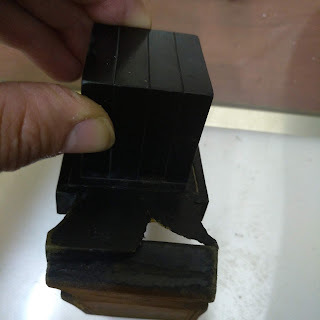 On tefillin and mezuzos I do not use a rapidograph to make an os kosher: for example a nifsak that is meakev or a mamash round yud (posul due to no kotz RT) I will use a sharp kulmus for repairs. This is out of respect for the minority opinions who maintain that rapidograph use is problematic. However for small tukunim such as revachim issues, tagin and other tikunim which are not machshir the os per se, I have no problem using a rapidograph. I see you are all missing out on the greatest part of dio lanetzach. Rabbi Zvi Shkedi developed an ink "especially for rapidograph"
I am using it for over a year -it works better than the rapidograph ink-furthermore if you botched up you can erase it as regular ink.It does not clog the pens-it has a haskama from the VAAD here in USA.and has local hashgacha on kashrus. Here in the USA hardly anybody uses dio min hashuk.If you can use the ultimate ink with the same convienance why use ink that Rav Wosner and Rav Stern are against? it has a small downside-on parshios shell rosh if you fix cracks you need to let it dry for a few hours before folding tight. Free shipping to everywhere else in the USA. It is sold in a few STAM stores in Yerushalaim and Bnei Brak, and I think that Klaf Bek have it in all their stores in Israel.